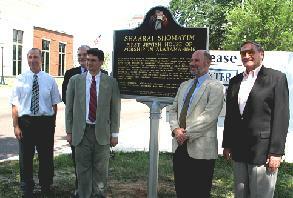 Jews have been part of Alabama’s economic, social and political life since 1764. It was not until 1841 that Mobile’s small Jewish community grew large enough to organize “Congregation” Shaarai Shomayim (Gates of Heaven). 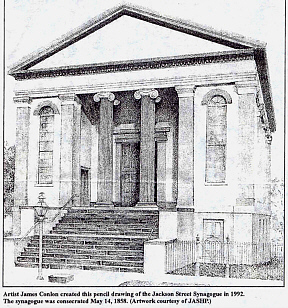 The community dedicated a small building on St. Emanuel St., between Church and Government Sts., December 27, 1846, as the first Jewish house of worship in Alabama. Shaarai Shomayim moved to a larger location on Jackson St., between St. Louis and St. Michael Sts., in 1853. The structure burned in 1856 but was quickly rebuilt through the combined ecumenical efforts of Christians and Jews in 1858. 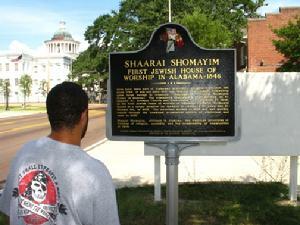 Shaarai Shomayim, affirmed in Alabama, the American principles of freedom of religion, assembly and the commonality of communities of faith.